Collingwood pulled of a huge upset over the Brisbane Lions by 14 points at the Moreton Bay Central Sports Complex. It was a good old game of wet weather fashion football between Collingwood and the Brisbane Lions. The Pies played exceptional football for the whole match and the Lions were stunned to say the least. However, in the final quarter the Lions had a late fight back, as they scored three of the last five goals of the match. The late goals could be important for Lions who have hopes of finishing top two on the AFL ladder. The Pies came out all guns blazing in the first quarter and the Lions could not put a halt to their immense pressure and intensity in and around the contest. They were fast starters in the opening half of the first term. As a result, the Pies scored the first two goals of the match. Christina Bernardi slotted through the first goal for the Pies after she received a handball pass from Caitlyn Edwards. Moana Hope snap kicked towards goal for a great goal of her left foot. Edwards set up another Pies goal, because she kicked to Bernardi who ran into an open goal. It was halfway through the opening quarter that the Lions kicked their first goal. This goal came via Sabrina Frederick Traub who took a very strong contested mark and she kicked a much-needed goal directly in front for the Lions, which helped weather the storm. Hope was awarded a 50m penalty and booted through her second goal in the match from the goal square. 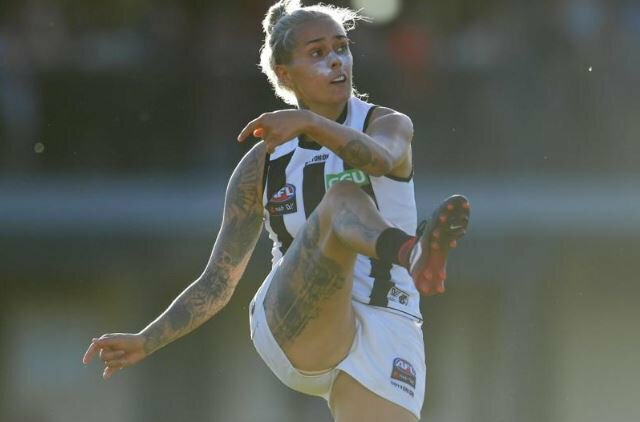 The Pies made an error in their kick out of defense and Nat Exon capitalised with a major from the goal square after she spoiled the kick out and picked up the goal and scored truly. It began to bucket down just before quarter time and this has made this contest a good old wet weather fashion game of football. At quarter time the Pies led by 14 points over the Lions. In the second term the Lions challenged the Pies, but credit to the Pies who were able to withstand their pressure. It was a goalless second quarter with neither team able to score any goals. Amelia Barden was in everything in the first half of the second quarter for the Pies. Chloe Molloy played very well in the second term with a cracking diving smother on Jess Wuetschner’s kick to save a certain Lions goal. Molloy also gave two repeated efforts, as she showed great composure to get the football out of her defensive 50 and forward. Molloy was able to get herself out of pressure twice by handpassing to herself. She especially was able to do this when she was being tackled and it was great poise shown by the 19 year old. Kaitlyn Ashmore placed a massive bump on Ruby Schleicher and as Schleicher was slow to get to her feet Ashmore checked to see if she was ok. It was great to see. There was about 5 minutes left in the second quarter and Schleicher went off the ground into the change rooms with what was reported to be a concussion test. Both teams showed desperation in this quarter. It was tough conditions for both teams who found it hard to hit their target's with the wet football. Late in the term, Barden came off the ground with what seemed to be a thumb injury. The Pies looked dangerous each time they went into their forward half of the ground, as they were playing efficient football when they were in attack. At the main break the Lions were down by two goals over the Pies. 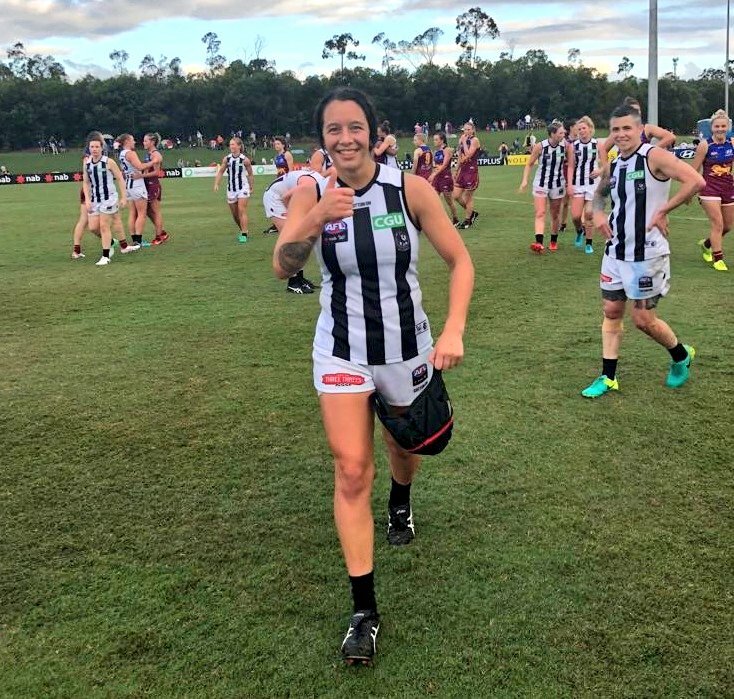 Schleicher failed her concussion test at half time so she took no further part in the remainder of the match, but good news for the Pies as Barden continued to play the rest of the match. The Pies continued to play with desperation in the third term and as a result they nailed the first goal of the quarter via Jasmine Garner who slotted it through metres from the goal square for an easy one. They kept the Lions goalless, as the Pies continued their dominance and capitalized in the third quarter on the scoreboard with two goals. The Pies held up well in their defense all game and it has been great to see how they have stood up against the Lions forwards. Meg Hutchins from a set shot kicked through a beauty of a goal from the boundary line on a wet day game of football – “SUPERB!” This goal surely will be up their for goal of the year! The Pies were up by 23 points at three quarter time over the Lions in a dominant display from the Pies. In the final stanza the Pies outscored the Lions two goals to one and there defense continued to play well. The Pies scored two goals in the last quarter. Jess Duffin the cricketer took a great mark in defense for the Pies. Brittany Gibson from the Lions placed a strong hard tackle on Barden. Sarah D’arcy kicked the football to Hope who hand passed to Brittany Bonnici. Bonnici hand balled the football over the top to Bernardi who nailed through the open running goal. Hope sealed the win for the Pies with her third goal of the match halfway through the last quarter. Wuetschner booted through a late consolation prize for the Lions. Kate Lutkins from a set shot from the boundary line slotted through another late goal for the Lions but it was too late for them, as time was a factor for them to overcome the Pies. The Lions came at the Pies late in the final quarter, as they kicked three late goals. Ashmore slotted through another late goal, which could be crucial for the Lions finishing in the top two on the ladder at the end of the home and away season. Pies were victors over the Lions in a massive upset.